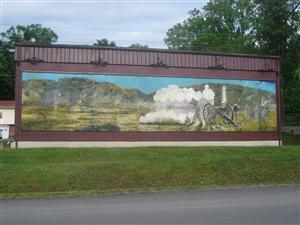 Directions: Be sure to catch the Civil War Mural on the side of a building [ Waypoint = N37 36.507 W90 37.758 ] that you will drive past on the way to the Ironton Gap Historical Marker. When you leave the courthouse, you will continue north on Main Street. About two thirds of the way, you should notice that Main Street parallels State Highway 21. After about 0.8 miles, Main Street turns to the east just before it intersects with State Highway 21. Just before this intersection, you should see the mural on the left.